After seeing Video Games Live on the stage in Milwaukee, I had to get this album when it was released. 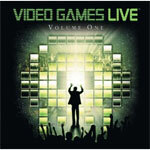 The actual touring show has many of the game’s soundtracks that they play the music from for sale, but this is the first Video Games Live soundtrack that has been released of the actual orchestra and choir performing. I got it in the mail today and I instantly popped it into my computer to start listening and I was stunned. It’s almost being right there seeing the show — maybe I think this because I’ve already seen it. Hmm… — Well, have a read of the CD’s description and go out and buy it! I have included a sample of Civilization IV at the end of this post. This song made me tear up it was so beautiful live and is by far my favorite video game song that I have ever heard. This entry was posted on Wednesday, July 23rd, 2008 at 8:32 pm and is filed under News. You can follow any responses to this entry through the RSS 2.0 feed. You can leave a response, or trackback from your own site.